How to Get the Best of Both Quality and a Good Price on Fine Art Prints? Click image to download a printable version of the “Ten Reasons to Buy from Local Artists” – Info-graphic and two other awesome gifts by becoming a fan on Art Print Express’ Facebook Page. Do you know all the benefits for buying local? It’s amazing how it builds and enriches a community. I want to encourage you to buy ART locally as gifts and to surround yourself with fine things. Here are ten reasons why making a purchase from a local resource benefits you. Please share this post with all of your friends if you believe in buying local too. 1. Buy local, treat yourself: Economic impact studies have shown that when you buy from local entrepreneurs, some of them are artists, more of your money stays in the community, continuing to support the economic base of the community. 2. Buy something unique: The artist marketplace is loaded with innumerable unique and creative items, perfect to bring your life with beauty and to give exceptional gifts. 3. Create good jobs: Artists are small local businesses, although we often think of them as being reclusive, they also employ helpers, marketers and use a variety of local services which make them a part of are the largest employer nationally and in their communities. 4. Save the environment: Many local artists recycle, reuse and repurpose items to create their work. 5. Keep our community awesome: The unique character of our community is defined by our activities. The unique art in your area is vital to that definition and can only exist with continued local support. 6. Inspire local prosperity: Artists are vital players in shaking off the increasingly homogenized world and defining the appeal of a community. Communities with distinctive character are more likely to attract entrepreneurs and skilled workers who will put down roots. 7. Invest in community: Artists are people who live in your community, are less likely to leave, and are more invested in the community’s future. 8. Support community groups: 250% more money comes from small businesses to support non-profit organizations than from large businesses. Artists give generously to local non-profits. 9. Get better service: Artists are selling the product of their love and labor. No one knows their product better. They take more time to get to know and befriend their customers. 10. Put your taxes to good use: Artists in the community move into distressed areas in the community and create new centers of activity making use of current infrastructure investment and making vital growth to the city’s economic development. There such a wonderful array of talented artists in the area and they can’t sustain their work without purchasing support. It’s an economic development fact. What is good for them is good for the local economy too. If every art walk attendee spent just $5-$20 on their evening out with complementary wine and food – just imagine the additional growth we’d see city wide. 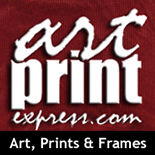 A quick and easy resource for regional art is on ArtPrintExpress.com, a local business, with a growing selection of reasonably priced fine art prints. It is a convenient place to browse and purchase a growing selection of Kansas artists’ work, many of which can’t be found anywhere else. Help spread the word, click on the info-graphic of all ten reasons to get a printable pdf to copy and share online or via email. I am going to ask you to “like” the Art Print Express Facebook page to get awesome free stuff which includes a report on how to know you are getting a quality print for a good price, a 20% off coupon (good until 3/15/2013 so hurry) for ArtPrintExpress.com and the info-graphic. We want to know what your opinion is about buying art locally. Please leave a comment below. I want to buy some art to hang in my house, but don’t know where to buy it from! I like your tip about buying from local artists because it creates good jobs in your own community. I know that we have lots of talented artists in our community, so it would be good to benefit both them and myself! This entry was posted on February 11, 2013 by mleivan in Art Buying Tips, News, What Makes Great Art and tagged Art Print Express, Art Tips, Artist, artitude, Contemporary Art, fine art, First Friday Art Walk, Kansas, Kansas Art, Michelle Leivan, regional artwork, something magic, Topeka, What makes Great Art. What Do You Miss with Just a Glance? How Much Does Your Alma Mater Inspire You? Is the Internet Killing the Arts? Are Women Artists Important to Our Future?